PASADENA, Calif. (Dec. 29, 2014)  The colorful floats won't be the only entries sporting fresh flowers in the Rose Parade on New Year's Day. The Cavalcade of Bands Honor Band will also be fully decorated, with band members wearing 2,400 roses on their specially designed uniforms. The floral touch is just one aspect that makes this band a fitting entry for the 2015 Tournament of Roses Parade, themed "Inspiring Stories." Following the band's performance at the Tournament of Roses Bandfest on Monday afternoon, co-directors Scott Litzenberg and Mitch Adams were visibly moved as the students exited the field. "That was amazing. I'm so proud of them," Litzenberg said. "The kids did that with only eight days of rehearsal." The emotion of the day was heightened, because just a few days earlier, a deadly tornado came within yards of the band's equipment truck while it was en route to Pasadena. 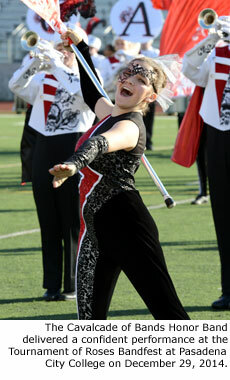 As an honor band, the Cavalcade band has drawn members from a wide region rather than a single high school. Adams said the band's 154 members represent 38 different schools from six Eastern states (Pennsylvania, Maryland, New Jersey, Delaware, West Virginia and Ohio). The geographic spread meant that band members rarely had the chance to rehearse as a group. 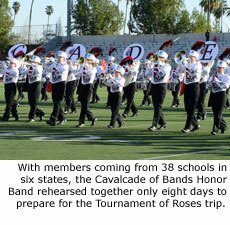 In fact, leading up to the Bandfest performance, the members had rehearsed together only eight days during the year. "We rehearsed one day in April, one day in May and had a three-day camp in July," Litzenberg said. "Then we rehearsed one day in November, last Saturday, and yesterday. That's it. The students have put their heart into this, and the great staff has done this as a labor of love." One reason Adams and Litzenberg are so passionate about the Honor Band, is that it provides a chance to march in the Rose Parade for outstanding students who might otherwise never have the chance to perform on such a prominent stage. 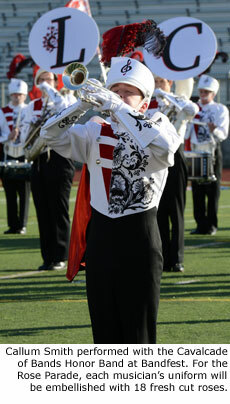 Trumpet player Callum Smith, a junior at Governor Mifflin H.S. in Reading, Pennsylvania, learned about the honor band last year when it was promoted during the Cavalcade of Bands fall marching championship. It was an easy decision for him to join the band. "I thought it was an awesome opportunity," Smith said. "And I love that we got to perform at DCI East in Allentown," referring to the band's preview performance at a major drum & bugle corps competition following the July rehearsal camp. To simplify the process of moving the band from the East Coast to Pasadena, instruments, uniforms and luggage were loaded onto a truck in advance, to be driven by a parent volunteer. Band members were then able to fly to California with only carry-on luggage, Adams said. The truck driver was traveling a southern route to avoid typical winter weather, and he was at his son's home in Mississippi on Christmas Day when severe storms passed through the area. Litzenberg said they were unable to contact the driver for two days, and when he finally spoke to the driver on December 27, he was shocked to learn what had transpired. A deadly tornado had ripped through the Mississippi town. "Eleven of the driver's family members and friends were killed in the storm," Litzenberg said. "The house 70 yards from where our truck was parked was destroyed. That's how close it was. But I know the band family. If we had come out here with no uniforms and instruments, somebody here would have taken care of us. We would still be marching." Fortunately, the driver and the band's equipment arrived in Pasadena intact, including the uniforms that were specially designed to hold fresh cut roses. Litzenberg is quick to acknowledge that this is not the first band to wear flowers in the Rose Parade. He was inspired by another band from the region that used roses with its feather plumes about 18 years ago. Nonetheless, it's a rare treat to see, and likely the first time a band is wearing a uniform that was specially designed with pockets to hold the blooms. Litzenberg presented his uniform idea to designer Brent Becker, who "took the idea to the next level." Although the uniforms have been tested with roses several times, the band members have never actually performed with the flowers. It is certain to be another touching moment when Adams and Litzenberg stand back and see the band in full bloom for the time. Band members will help prepare the 200 dozen fresh roses, and will begin attaching them to their uniforms just before midnight on New Year's Eve. The band is proving to be a great ambassador for the Cavalcade of Bands organization. Founded in 1959, Cavalcade of Bands is a non-profit that provides competitive opportunities for marching units, including fall field contests and winter indoor guard and percussion events. They also sanction non-competitive events for jazz bands. The organization currently boasts membership of more than 100 schools. For more information about the organization, visit CavalcadeOfBands.org. Catch the Cavalcade of Bands Honor Band on the live broadcast of the Pasadena Tournament of Roses Parade beginning at 8:00 AM (Pacific) on Thursday, January 1. The band is unit #70 in the parade and will appear within the final thirty minutes of the 2-hour event. Follow along with the 2015 Rose Parade lineup.